This week I would like to take you a little bit beyond Second Life to Amaretto Web Sites. This is the main Amaretto Web site there you can find plenty of things to check out!! This is where you can advertise your market. This is the place where you can ask a question about anything Amaretto. This is the place you can post pictures of your favorite Amaretto Breedables. You can also create your own album here. This is where you can create your own group. This site is for you to check what classes you have taken or need to take. This section is used by the Amaretto staff to get important messages out into the community. Please check this section often for important blogs from Amaretto Ranch Breedables. 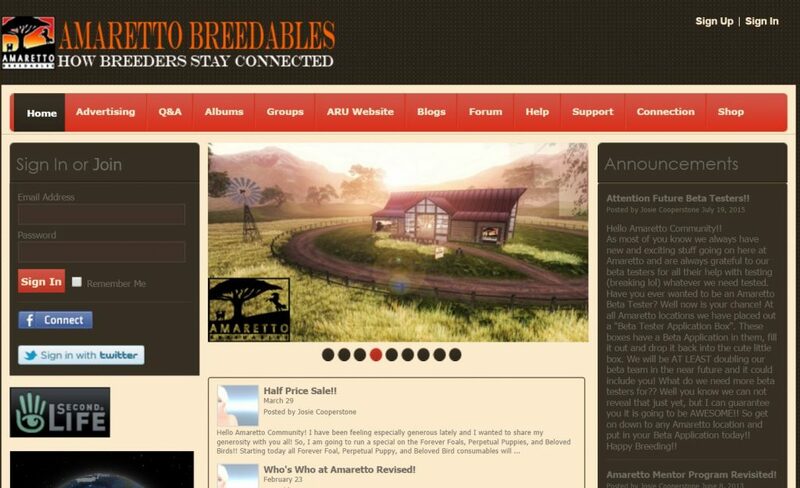 Amaretto Ranch Breedables Social Network offers Forums that range in a variety of topics. Can’t find the topic you’re looking for? Go ahead and create your very own. I would like to mention that often people use this area to advertise their “For Sale” breedable. We have sections that cover Amaretto Horses, Amaretto K-9s and Amaretto Barnyard Birds. This section is packed with some of the most useful resources available to the Amaretto Community. Here you will find the online manuals for all the breedables along with video tutorials for many of the frequently asked questions. This is where you will come if you need to file a ticket regarding an issue or even if you would like to submit a suggestion. The Amaretto Ranch Team does daily connections. This is the section to view current and past Connections. There is LOADS of useful information located here. Find out the entire goings on at Amaretto Ranch Breedables here. Would you like to bring a little Amaretto into your real life? Well this is the place for that! Here you will find many items for sale in the Amaretto Store. A great place to purchase gifts for your friends! Got a special event planned? This is the section for you! Post your events and check out events happening around the Second Life grid as it relates to Amaretto Ranch. So as you can see there are plenty to check out on Amaretto Web site.